Embedding BI into your enterprise application can empower users to interact with application data to extract valuable insights. But how can you decide whether you should build your BI functionality from scratch or invest in third-party BI software? 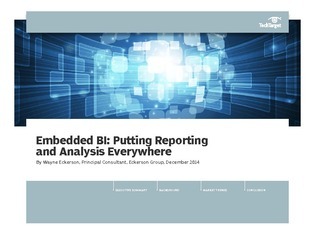 In this comprehensive research report, BI expert Wayne Eckerson explores results from a survey conducted with over 2,000 respondents about embedded BI trends. Learn the pros and cons of building or buying BI functionality, and discover how BI vendors, independent software vendors that don’t sell BI tools, and user organizations have dealt with this question.